While pondering the possibility of geosynchronous spacecraft running into an out-of-control or very inclined one (around the 150-deg. West area), I was reminded there’s a reason we call it “space.” There’s a lot of it out there. 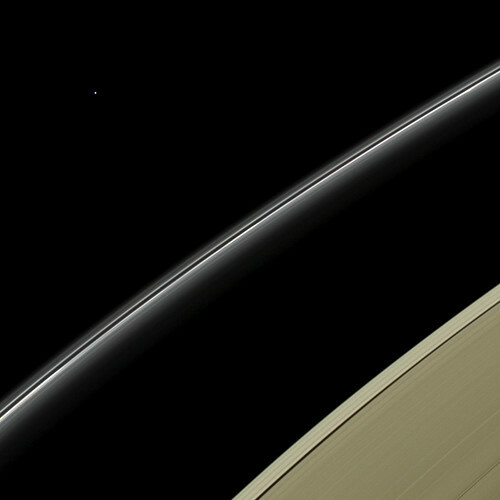 The gorgeous image from our friends at the Cassini Solstice Mission is one that’ll make you think about space. Uranus is a pale blue in this natural color image because its visible atmosphere contains methane gas and few aerosols or clouds. Methane on Uranus – and its sapphire-colored sibling, Neptune – absorbs red wavelengths of incoming sunlight, but allows blue wavelengths to escape back into space, resulting in the predominantly bluish color seen here. Cassini imaging scientists combined red, green and blue spectral filter images to create a final image that represents what human eyes might see from the vantage point of the spacecraft. Uranus has been brightened by a factor of 4.5 to make it more easily visible. The outer portion of Saturn’s A ring, seen at bottom right, has been brightened by a factor of two. The bright ring cutting across the image center is Saturn’s narrow F ring. Uranus was approximately 28.6 astronomical units from Cassini and Saturn when this view was obtained. An astronomical unit is the average distance from Earth to the sun, equal to 93,000,000 miles (150,000,000 kilometers). This view was acquired by the Cassini narrow-angle camera at a distance of approximately 614,300 miles (988,600 kilometers) from Saturn on April 11, 2014. Image scale at Uranus is approximately 16,000 miles (25,700 kilometers) per pixel. Image scale at Saturn’s rings is approximately 4 miles (6 kilometers) per pixel. In the image, the disk of Uranus is just barely resolved. The solar phase angle at Uranus, seen from Cassini, is 11.9 degrees. The images our space program produce are free. Getting big print made suitable for framing is available here. They do custom orders, so if you don’t see what you want — go out and find it, then have it done that way you like it. Nicely done by the folks over at HubbleSite. THAT would look cool running on a big flat screen. Some would argue that’s a waste of electricity, so you might as well get yourself a big print instead. Nice video rendering. We know it’s really not that pretty. This video shows Hubble observations of Arp 116, a pair of galaxies in the constellation of Virgo. It is made up of M60, a large elliptical galaxy, and a smaller, bluer spiral galaxy, NGC 4647. It has long been unclear whether the two galaxies are actually interacting, or whether they simply appear close together from our distant vantage point. However, detailed studies of Hubble pictures suggest that the pair are beginning to experience tidal forces. 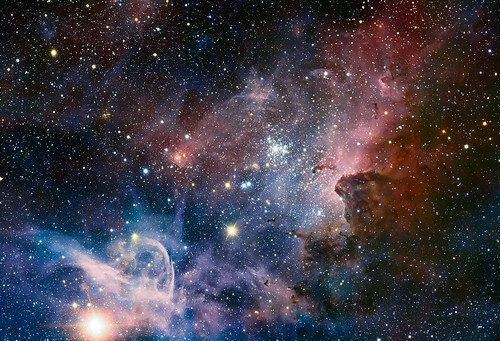 This broad panorama of the Carina Nebula, a region of massive star formation in the southern skies, was taken in infrared light using the HAWK-I camera on ESO’s Very Large Telescope. Many previously hidden features, scattered across a spectacular celestial landscape of gas, dust and young stars, have emerged. Get yourself a huge piece to hang on your wall at Big Bang Prints. Good stuff!